Joshua, 33, was born in Tacoma, WA, raised in Denver, CO, then moved to Virginia at 16, before coming to Arizona five years ago. Joshua graduated the Electro-Mechanical Technologies (EMT) program at RSI in January 2018. 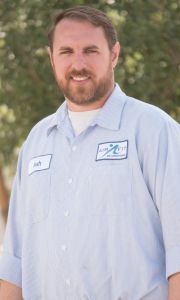 He works for Air Fit Air Conditioning in the East Valley. Thanks for your time, Joshua. Why did you choose to study HVAC? Before coming to RSI, I worked at an apartment complex for about two years as a maintenance tech, using my construction and handyman skills. 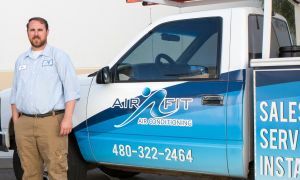 I knew nothing about air conditioning, but while working there, we’d fix simple things on AC units like run caps or outdoor fan motors, but when it came to the actual refrigeration side, they’d always hire the job out. Watching those guys and seeing what they got paid, it seemed like a career I should look into! Where did those handyman skills come from? I grew up in a contractor’s home. My dad started out as a painter, then moved on to siding doors and windows, then he did ceramic tile work for about 10 years. So I knew most of the tools and have been around the construction trade most of my life. I worked at Lowe’s and Home Depot for a couple of years. I was a handyman for a couple of real estate agents in Virginia for five years doing foreclosed house work—minor repairs, handyman stuff. I worked a couple of warehouse jobs, too, but they weren’t really for me. So why did you choose RSI? I wanted to be outdoors and do more hands-on and maintenance stuff. That’s what led me to HVAC. I came back to Arizona, and a month later, I was enrolled at RSI. Tell us more about the RSI enrollment process. I emailed RSI for more information. A few hours later, someone from Admissions called me and invited me to the campus so I could get a feel for the place. I went that same day, walked through the campus, filled out some paperwork and was enrolled all in one day. What sold me on the tour was going into classrooms and seeing actual AC units sitting there that we’d work on, seeing electrical boards and components on the wall in the classroom. It was clear that it wasn’t going to be all bookwork. That was awesome. The amount of hands-on time. Also, the one-on-one instruction that I’d get if I was struggling with something. The teacher would give me the attention that I needed. I don’t think you’d get that at any other college. One of the best things about the school is the different phases. You’re in a class for an entire month, learning one thing backward and forward, upside-down and right-side up. Then the next month, you move to the next phase and start learning another feature. They don’t throw a bunch of different things at you all at once. Did you use the Career Services team? Career Services is a great help. They help you build your résumé, and they actually bring companies to RSI that are looking for employees; that’s how I got my job. You can basically go down the line and pick and choose who you want to work with. Andrew with Air Fit was there one day with a booth. I was looking for a company to work with my schedule. I was in the morning class; a lot of companies want you to move from the morning class to the afternoon or night class so you can work for them in the mornings before you graduate. But I needed the morning class. I was fresh, and that’s the best way I can learn, so I was looking for a company that would work with me on that. Was this at one of the quarterly career fairs on campus? Once a quarter they have these huge career fairs where 10, 15 or maybe 20 employers are on campus looking for employees, but maybe once a week here and there they have a random company come in and set up a table or booth. That’s how I met Andrew with Air Fit. August 2017, about halfway through my program. I gave him my résumé but didn’t hear from him for about two weeks. Long story short, I called him back and he’d forgotten all about my résumé! I worked with him part-time from September until January, helping on installs, learning more of the trade with him. It was great that I could apply what I was learning in school immediately. When I finished school, he brought me on full-time and gave me a raise. I’ve gotten two more raises since then! What was it like getting your first full-time HVAC pay check? Definitely more impressive than the apartment complex check! I’m still green behind the ears, so I’m not making “beaucoup dollars” like some guys, but that’s fine. I know I’m still in the learning process. I’m still making simple mistakes. But even so, that first paycheck was still $300 more in a week than I made at the apartment complex. You’ve only just started your career, but where do you see it going? For the foreseeable future, I plan to stay here with Air Fit. I think I’m on the ground floor of something good. He’s been good to me, working with my schedule. The fact that he’s willing to work around some of my personal stuff is a big deal to me. What do you enjoy most about your trade? Getting people comfortable again. In our customer’s eyes, we are heroes! They are so thankful and happy when we get their house cool again. I get a sense of satisfaction knowing that I’m doing something important, something meaningful that helps people. That’s a good feeling. What advice would you give to new students just starting out at RSI? The biggest thing is to take advantage of the career fairs and the opportunities to connect with people. I went to two career fairs and probably only saw 10% of my classmates there. You need to start making connections with employers and potential supply houses that you’ll be going to. I think that’s the biggest piece of advice I could give. You’ll find a job a lot quicker by making those connections, maybe even before graduation like I did. Take advantage of all the resources the school makes available to you. If you’re an RSI graduate and would like to share your success story and be an inspiration to others, please email [email protected] to be considered for a Graduate Connection interview. Please include details such as your graduation date (month/year), and program.